Triangles are all the rage these days. Just a glance through DIY décor ideas on Pinterest will tell you that much. Seeing as our friend Perrin PimPim has been bitten by the triangle bug, Taloline and Clelola decided a homemade triangle baby blanket would make the perfect baby shower gift for her. They weren’t wrong! Taloline and Clelola sneakily made use of Pinterest’s secret board feature and created the distractingly named “Choco” board just for us. From there, they went a-searchin’ for triangle patterns. 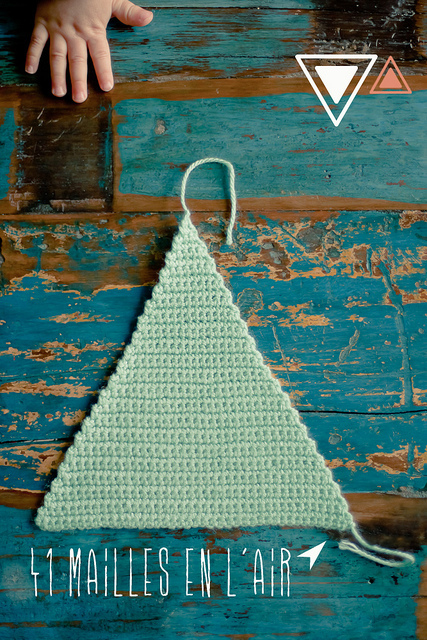 They decided to go for crochet because it seemed quicker and simpler than knitting for making triangles. The pattern they decided on is an easy step-by-step tutorial by MorganOurs they found on Pinterest. The slight modification we made was instead of simply not crocheting the last stitch on each end, we decided to do a decrease stitch on the ends for a cleaner look. The girls decided on a color scheme of 7 complementary colors and visited Mouliné Yarns here in Montreal to pick out the best yarn. The yarn had to be, of course, machine washable for practicality! So they picked out an old, reliable option: Berroco Vintage yarn. 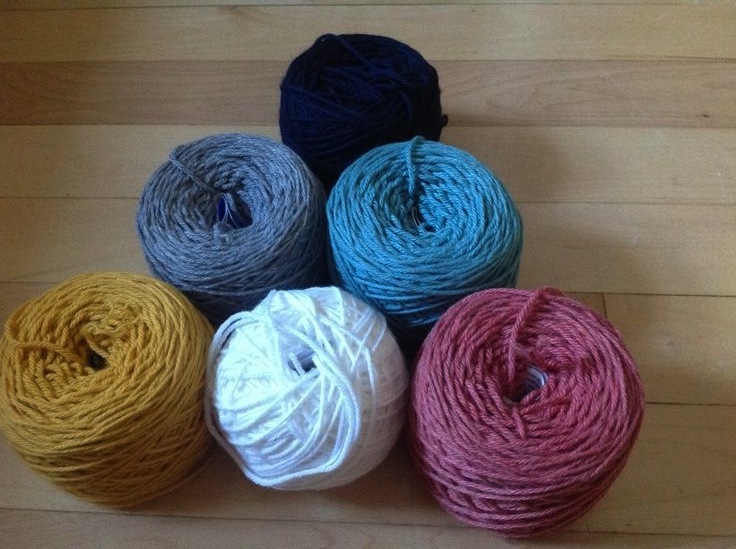 It’s a wool-acrylic blend and it comes in a wide variety of beautiful colors. 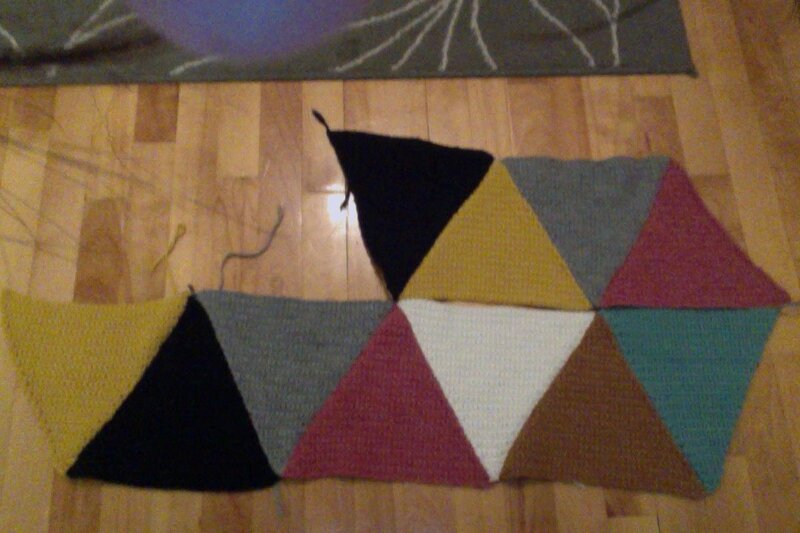 We each had to do at least 4 triangles, and those of us with more experience crocheting did a couple more. The pattern said to use a 4.5mm hook, but since we were three different people with three different tensions, we all ended up using different sizes to get the final triangle size right. After a couple of screw-up attempts (Taloline and I found ourselves decreasing too quickly), we finally got the hang of it and started producing our beautiful triangles. I crochet in the back, while the girls crochet in both. 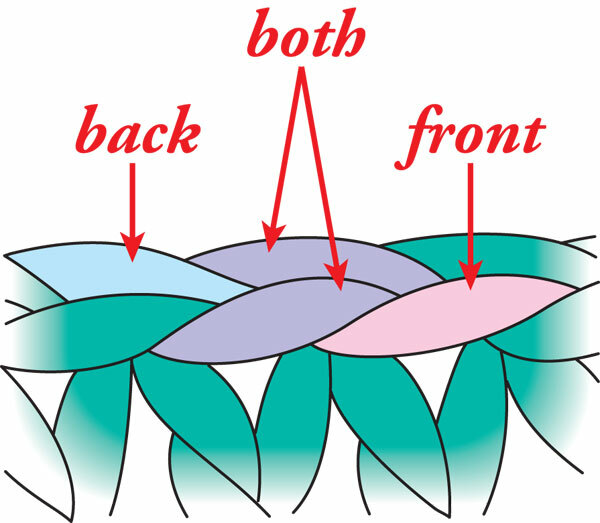 I learned to crochet in the back loop only (see figure) rather than in both loops. The others crochet in both loops. We decided, though, rather than have me do my triangles over again, that the different textures looked quite nice when put together. We would just have to be sure to mix my triangles in well with the others’. 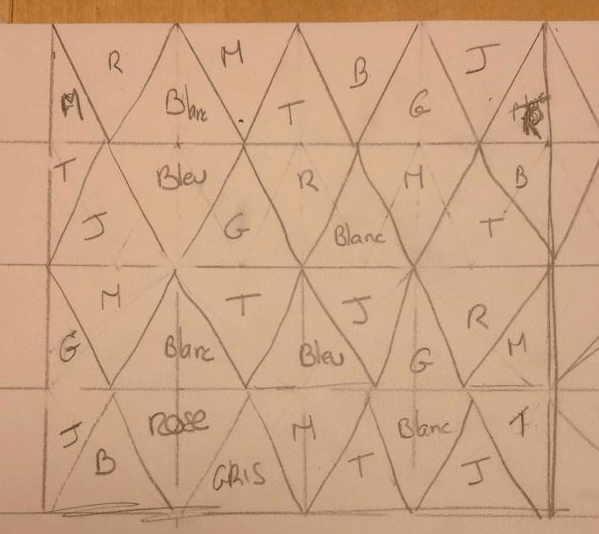 In one evening, after finishing up our last triangles and deciding who was to make which half-triangles and in which colors, Clelola set about placing the colors in the right order. This was delicate because we didn’t want colors to repeat too frequently within a row or a column. Clelola spent quite some time placing the triangles on the floor, trying to decide what would work best. We probably could have used some kind of Excel spreadsheet to place them so that they were mathematically correct, but whatever. It looked fine to us. I was given all the finished triangles to block, and took this responsibility very seriously! 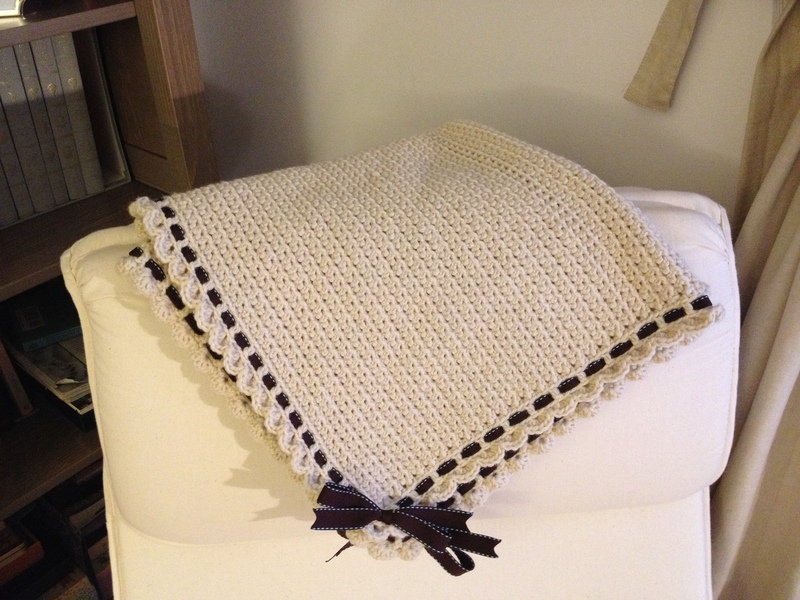 Some people block simply by ironing the piece with a towel placed between the iron and the crocheting, to avoid squishing the pattern too much. I learned, though, that the best way to block is to fully wet an item and pin it out to dry. So that’s what I did. Using my new washing machine’s delicate wool cycle (how I love it! 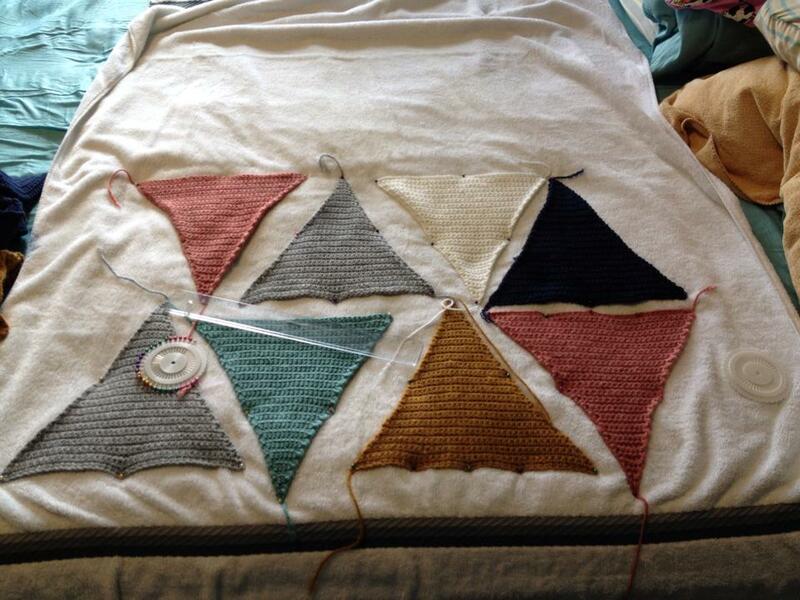 ), I washed all the triangles and pinned them out on my bed over some towels. It was a tedious process, and I had to do a lot of stretching and measuring to try to get them all the same size. In the end, I finally also ironed them for good measure. Oh well. We were each assigned a row or two and our homework over the next couple of weeks was to sew our designated rows together. I, of course, finished mine just before the girls came over to assemble all the rows together (whoops! Procrastinator!). 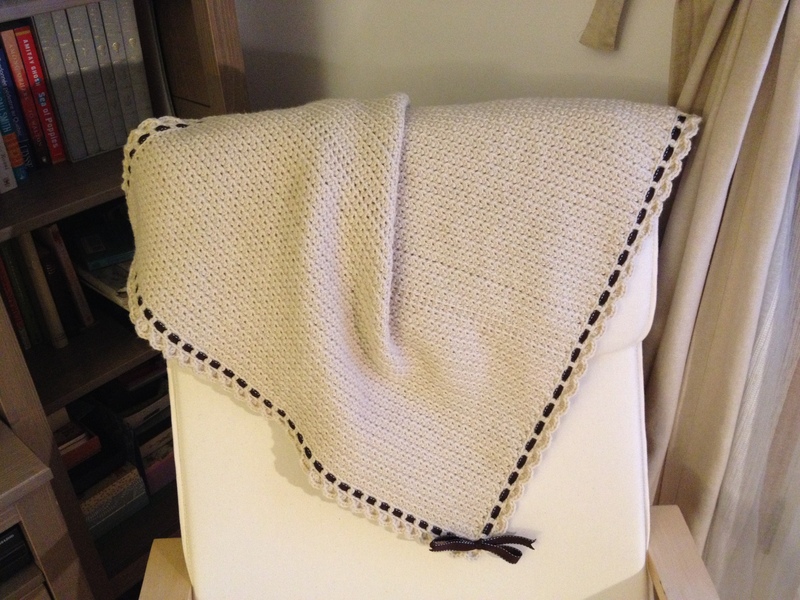 To add a touch of class (and to incorporate another craft) to the project, we visited Effiloché and picked out a great fabric to add as a backing to the blanket. 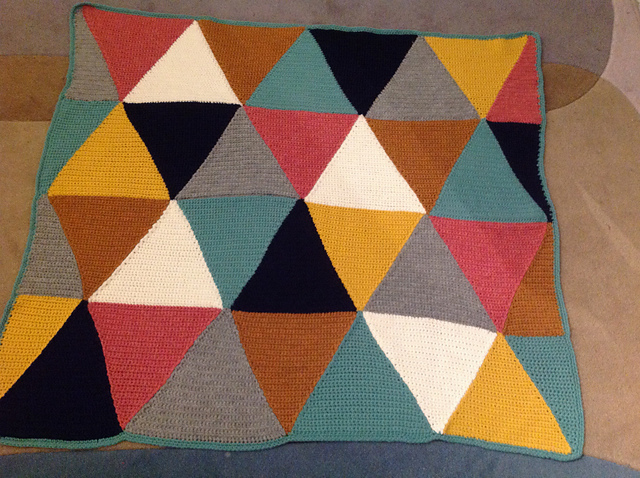 Normally, if sewn correctly, there is neither a “right side” or a “wrong side” to a blanket like this (it’s a bit like a granny square blanket). But we liked the idea of making it feel like a quilt-crochet combo. 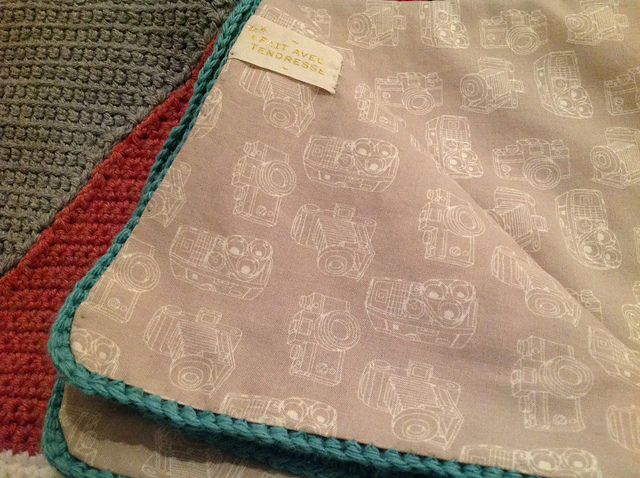 Perrin PimPim’s other half is a photographer, so we thought he’d enjoy this fabric on the baby’s blanket. Needless to say, we were all mightily pleased with the result, and Perrin PimPim was delighted, both by her surprise baby shower and by her homemade gift for her little bundle of joy. Thank you to Taloline and Clelola for organizing the gift idea and for a fun time putting it all together! Brand: Cascade Yarns. Color: Natural. Ribbon: Offray brand in chocolate brown. There is some unevenness and I’m not exactly sure why. My stitch stayed pretty even throughout but I think there’s one row where it got tighter than the others. Ah well, as my Chico said, “It shows it’s a work of art.” Hehehehe, or something like that! The yarn is ecological wool, and it’s very soft. The only problem is that it’s not machine washable. It has to be hand washed in cold water with Woolite or something similar and dried flat. Probably not the best for a baby blanket, but the quality of the yarn couldn’t be beat. The ribbon threading was a bit tedious but worth it for the result. Look how cute! 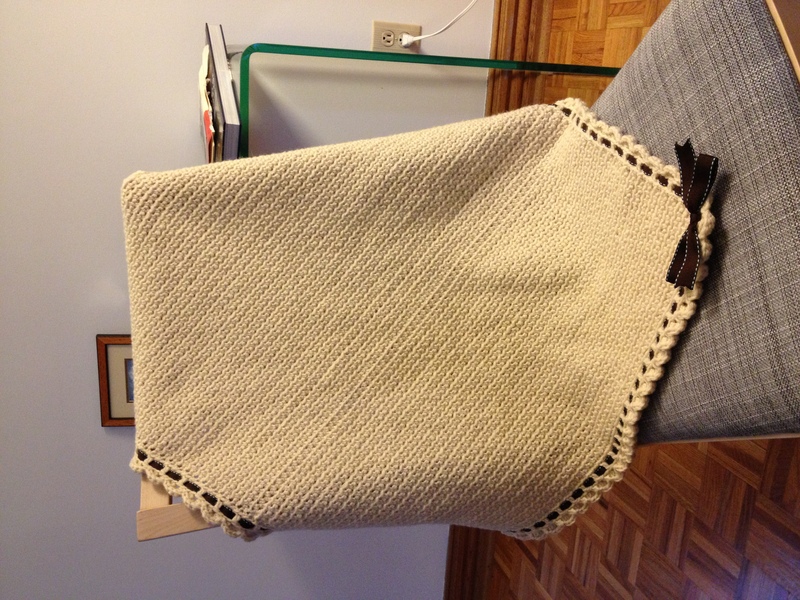 I made the blanket a little bigger than the pattern called for, but I really found it way too small in the original. Next up in my line of projects, an amazing chain link scarf from Knits for Life.